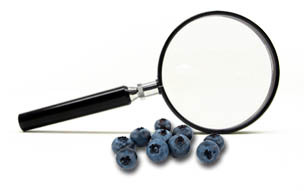 Blueberry flavor is directly related to ripeness. When harvested at full ripeness, berries will have the best sweetness and proper firmness. Over-ripe fruit will be too soft. Under-ripe berries will lack flavour due to low sugars and higher acidity. Properly cleaned and packaged fruit will have no stems, leaves or other non-nutritional elements. All unripe or over-ripe berries are removed during the process. Much of our harvesting and processing equipment has been designed by us to ensure maximum efficiency and quality control. Blueberries can be easily damaged by improper handling techniques and adverse climate harvesting. We ensure our crop handling and processing practices are of the highest standards to provide a quality packaged product. We care about protecting our reputation and recognition as growers and harvesters of high quality fresh wild blueberries; several processors in both Canada and the U.S., who have sourced our fruit in recent years, have told us that rarely has more pristine and better quality fruit entered their facilities from any source. We intend to carry through this same level of commitment and attention to detail in every phase of our plant operation - from thorough preparation of the fruit prior to entering the high capacity freezing tunnel to impeccable color and size inspection of processed fruit prior to packaging operations, both manually and with the aid of state-of-the-art specialized inspection equipment. We have developed a brand, MOUNTAIN WILD BLUEBERRIES, in a commodity environment, which is backed up by delivery of consistently high quality to our customers, extending the same practices of care for processed product as for the crop that 'Mother Nature' delivers to us in our fields. Since August 2014 start-up, we have met stringent quality assurance and food safety requirements and expect BRC (7) accreditation in the fall of 2015; our IQF Grade A product has been well accepted in both European and North American markets. Our field management practices and custom-built, double-header harvesting equipment consistently places evenly clean and pristine fruit into our collection bins with yields per acre well in excess of industry standard. Our blueberry fields are spread across a wide geographical area in both Nova Scotia and New Brunswick, Canada. This permits progressive harvesting from different areas as fruit ripens to the optimum point. Meeting and exceeding food safety and quality assurance standards established by our industry in collaboration with food processors and distributors is our highest priority with our own high quality fresh fruit. Compliance with SQF 2 certification standards is presently underway and will be complimented with other accreditations (e.g. Kosher).